These are the stuff I use frequently. Those featured on "No Longer In Use" are items that are either very seldom used (kind of on stand by) or not used at all now. The most costly brand but also the best. 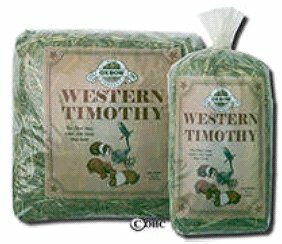 It is timothy based which is great & on top of that, it contains no additives, artifical colors, preservatives & animal by products. More info can be found on my "Cavy Feed" page. Although costly, this is definitely the pellets to use if you can afford it. Oxbow's distributor is Eagle Territorial Agencies & you can contact them at 6841 6663. Online you can visit http://www.eta-eagle.com or email eagle@starhub.net.sg. Their address is 5 Kaki Bukit Rd 2, City Warehouse, #01-09 / #02-09, Singapore 417839. After a frustrating & fruitless search for nice & green second cutting timothy, I finally gave up & bought Oxbow orchard grass hay instead. 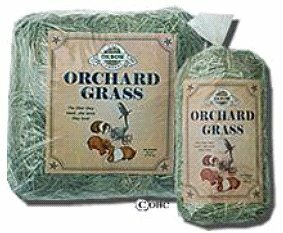 Oxbow orchard grass hay tends to be more green than their timothy & is soft & leafy. It used to cost more than Oxbow timothy but is now the same price. My first choice is always Oxbow orchard grass & if its out stock, my alteratives would be Oxbow timothy followed by APD timothy. Oxbow timothy tends to be inconsistent in quality. Sometimes its quite green & at other times its rather yellowish. At times its also too finely chopped & falls out of the hay rack. I got pretty fed up with the inconsistent quality so now I prefer Oxbow orchard grass hay & get Oxbow timothy only if orchard grass is out of stock. APD has no distributor so shops like Pet Essentials import, re-pack & sell. Amount of hay may vary according to shops but I find Pet Essential's bag quite reasonable in size. It is always second cutting timothy & the quality is quite consistent. I've yet to see yellowish APD hay although it tends to be rather brown. It costs more than other brands and that is why I only get APD when Oxbow orchard grass & timothy hays are sold out. The canister has a lid however I don't think it is airtight. Therefore I'd be careful to ensure the nuts do not go rancid. This is particularly since its quite a big canister & may take as long as 2 months to finish. But don't overfeed just 'cos you're worried they go rancid! 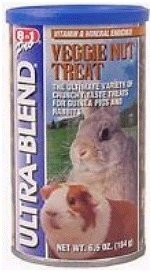 Contains some alfalfa pellets so its not suitable if your cavies have a condition in which they should not be fed any alfalfa at all. 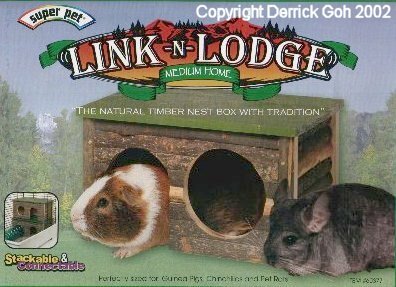 My cavies' number 1 favourite & they wheek like mad for it! Occasionally I may buy other treats but there's always a can of this around. Vitakraft Asia Pacific is located at 25 International Business Park, #04-07 German Centre, S'pore 609916. They can be contacted at 6562 9136. The pic you see above is the old packing. The new box is labelled "for rabbits" but is safe for cavies too. Please refer to my "General Advice" page for more info on this. There are 12 slims in each box & the centre is hollow so don't be suprised to see it eaten in no time! Its rather crunchy which is different from alfalfa blocks which are downright hard. I'm quite sure it will go mouldy in the box so I pour it into a ziplock bag. If it remains dry & relatively air tight, it should be fine in the ziplock bag. 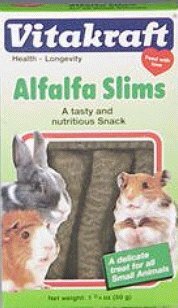 My cavies are all mature so I limit their intake of alfalfa slims & give them 1/3 piece each once a week. So the 3 furballs equally share one slim per week & one box will definitely last me 3 months. In my opinion, the best bedding available! It absorbs moisture well & really holds it in so cavies remain dry. Controls odours well too. More info about it can be found in my "bedding" sub-page under "Safe bedding". 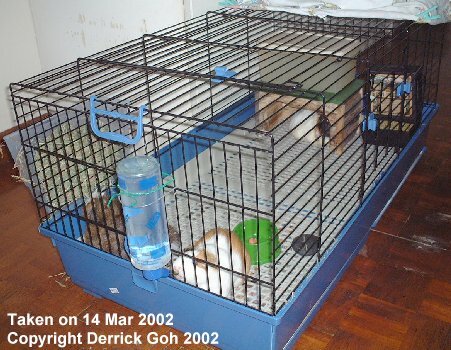 This cage is a massive 100 X 53 X 47 cm (L X W X H) or 38.5 X 20.5 X 18.5 inches and as you can see from above, the girls have plenty of place to run even with the hut in the house. 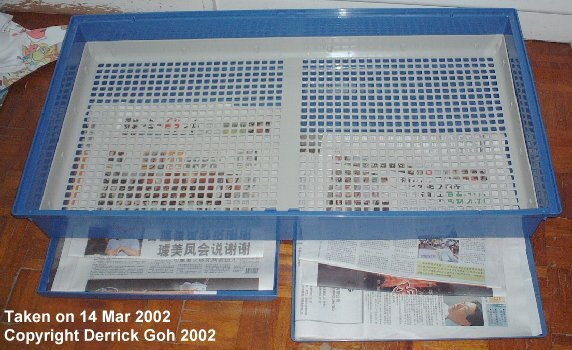 It has two removable trays below the grid as you can see from the picture below. 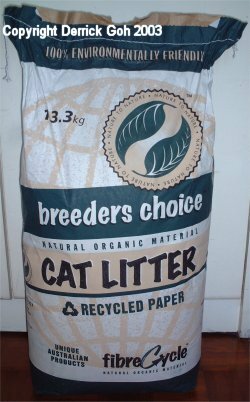 So you can slip out the two trays, change the litter & don't disturb the furballs. The "Tommy series" comes in 3 sizes & my cage is the second largest. 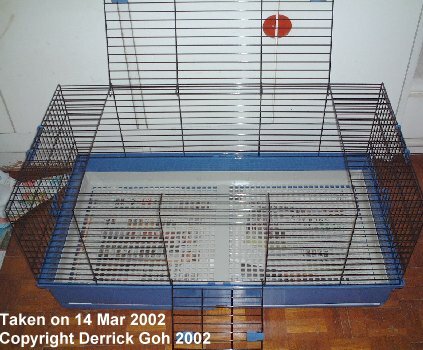 The largest Marchioro cage is 118 X 58 X 52 cm but has no plastic grid. For the record, my cage could barely fit in the car! In addition, this cage also has two doors. One is by the side & measures 24.5 X 26.5 cm (L X W) while the other door is on the roof measuring 65.5 X 40.5 cm. I recommend the top opening be used only for putting in big things like huts. Cavies should always go by the front door. You wouldn't want to accidentally drop them from the top door! The bars on the width are vertical while those on the length are horizontal. This versatility will be useful 'cos some accessories only work with vertical or horizontal cage bars. It comes with a plastic hay rack (pictured below) which is different from what we are used to. 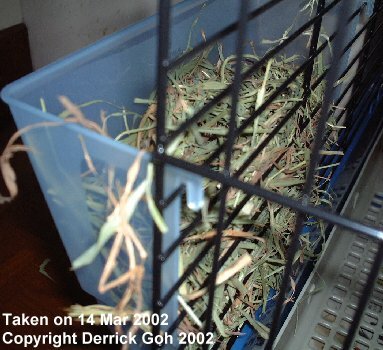 This rack attaches to the outside of the cage & the opening is facing inside the cage, allowing cavies to eat from it. I find it works as well as the normal wire type racks although one has to be careful 'cos if not attached properly, all the hay will fall out the bottom in no time. Also, all it takes is one bump to dislodge the rack so care is needed. I cover the grid with a piece of Coroplast so this cage becomes like a normal plastic bottom cage & I use it with Breeder's Choice bedding. More info on the Coroplast sheet in my "housing" sub-page. Very simple to assemble. The 2 openings in front are a little too small for most adult cavies so you may have to modify the front by sawing & sandpapering it. It can fit one cavy but two can squeeze in provided they're willing to share. I don't glue the roof on so that I can remove it in case of emergencies. 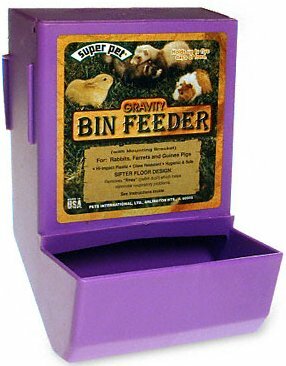 This feeder has a feeding area which is large enough to prevent pellet blockages. 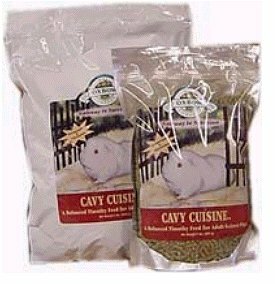 Your cavies also don't have to struggle to eat, compared to a hopper with small feeding area. There is also a sifter base to ensure food dusts falls through to the floor, instead of being inhaled. This book may not be detailed enough for experts but is more than sufficient for beginner to intermediate cavy owners. It has a good combination of info ranging from bedding & food to medical & history. Some books I've seen often miss out a section or 2 but not this book. If you ever need a book to refer to, this is the one! 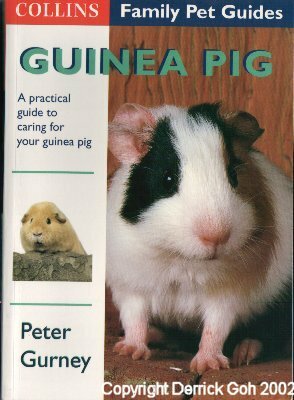 You can try emailing the author, Peter Gurney, who is 1 of the most well known Cavy experts in the UK. He does reply from time to time.